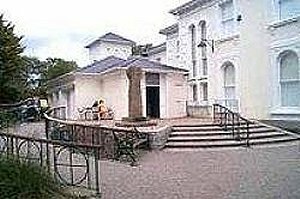 Penzance is fortunate in its Penlee House Gallery and Museum situated in Penlee Memorial Park. The 19th century Penlee House contains important collections of works of art, archaeological artifacts and exhibits that reflect the history of West Cornwall and its people. In the gallery are examples of the work of the Newlyn School of Painting as represented by Stanhope Forbes, Walter Langley, Elizabeth Armstrong, Edwin Harris and Norman Garstin. Later works of the 20th century include paintings by Lamorna Birch, Charles Simpson, Harold Harvey and Dod and Ernest Procter. A selection of the work of the Newlyn Industrial Class, an off-shoot of the Arts and Crafts movement, is usually on display. The Penlee complex has wheel-chair access, a well-stocked gift shop and a delightful cafe and terrace overlooking the trees and flowers of Penlee Park. The Museum has recently been given a Gold Award as the best small visitor attraction in the South West Tourism Awards.